The truck is equipped with electric pumps, piping , flow control system, constitute diesel generator sets, electrical control box, remote control devices, lifting systems, spray arms and nozzles. The high pressure atomizing water into fine particles of about 50μm, through the mist to the remote air guns within a radius of 100-120 meters, 5 minutes work to achieve coverage area of over 45,000 square meters, is locally reduced PM2 .5, PM10 particulate matter exceeded the ideal technology caused haze of pollution, is a more advanced, more scientific, less energy, purifying effect significant new air purification technology. 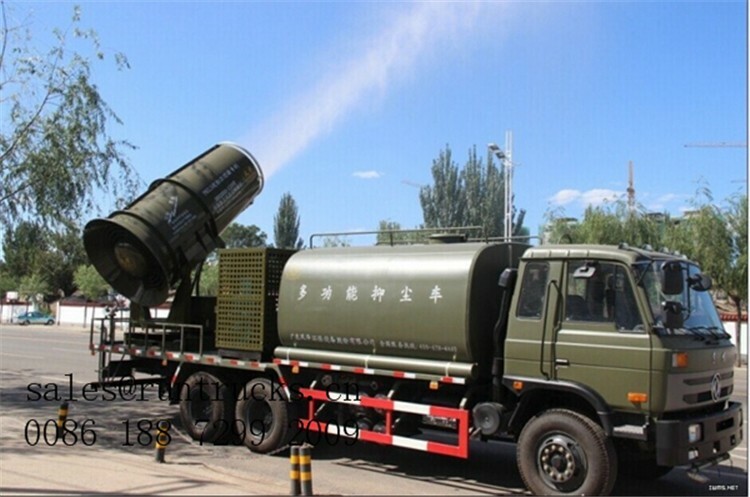 The high pressure atomizing water into fine particles of about 50μm, and through the mist to the remote air guns within a radius of 100-120 meters, 5 minutes work to achieve coverage area of over 45,000 square meters, is locally reduced PM2 .5, PM10 particulate matter exceeded the ideal technology caused haze of pollution, is a more advanced, more scientific, less energy, purifying effect significant new air purification technology. What is the application of our product? 1.Environmental protection: City pm2.5/10 dust control, Disinfection epidemic prevention, City Demolition,Odor control at waste disposal & landfill sites,Humidifying, cooling and dust control on construction site, etc. 2.Industry dust suppression:Open pit mining blasting/digging/ load&transport dust , Port material storage yard dust , Wharf Bulk Ships loading&unloading dust, Iron & steel plant stockpile & slag disposal dust, Power plant coal storage yard dust, Conveyor belt blanking point dust, Coal mine crushing dust,Haul roads dust,Storage and handling of bulk materials dust, etc. Using :bulk materials during transport , anti-dust pollution and slag yard, coal yard, construction sites, automobile coal dust ,fixing ,iron and steel ,building materials ,cement ,enterprises of various open-air yard ecological slope protection and other aspects. rear protection from the ground:540mm.